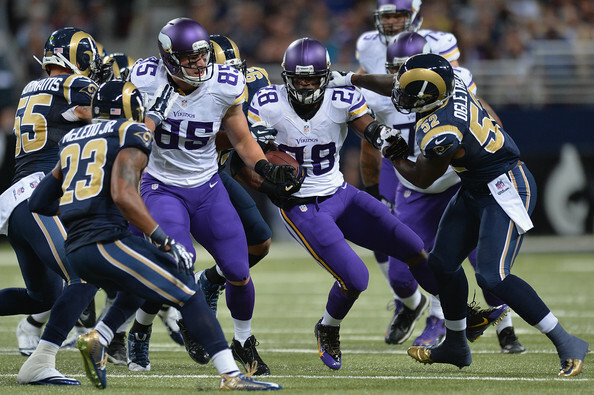 The Vikings (5-2) will return home for a critical matchup with the St. Louis Rams (4-3). It's only November, but this game could have playoff implications in a tight NFC Wild Card race. Daniel House previews the game and provides his keys to victory. The Vikings (5-2) will return home for a critical matchup with the St. Louis Rams (4-3). It's only November, but this game could have playoff implications in a tight NFC Wild Card race. The Vikings will have their hands full with a Rams defensive line that is one of the best groups in the league. Not to mention, they'll need to stop rookie sensation Todd Gurley on the ground. Both of those tasks won't be easy, but much of the same can be said for the Rams too. The difference in this contest will be which team can win the battles up front. Each squad has a similar amount of weapons, but they need to put them in a position to succeed. Protecting the quarterback and paving the way in the ground game will ultimately determine who walks away victorious on Sunday at TCF Bank Stadium. As a rookie, Todd Gurley is already drawing comparisons to Adrian Peterson. He's played five games in the league, but has rushed for 100+ yards in four of his first five contests. The only other person to do that: Peterson. Gurley is a running back that can ferociously break tackles, make moves in space, and exploit any of your weaknesses from a gap containment standpoint. Stopping Gurley starts by staying in your lanes as linebackers, while tackling extremely well. Arm tackles won't work against him. The Vikings have missed very few tackles thus far, but haven't faced a running back with a skill-set like Gurley's. The St. Louis offensive line hasn't been fantastic. Nonetheless, he's still found ways to make big plays when their offense needs it most. Nick Foles is far from a threat at quarterback, but if Gurley can run well, it opens up the passing lanes for any quarterback under center. The Vikings have allowed the 11th-fewest yards to opposing running backs and will need to continue this trend against a team that has a running attack like the Rams do. If you watch the tape of when St. Louis played Green Bay earlier this season, you'll see how the Vikings defense needs to approach handling the Rams offensive attack. The Packers blitzed a poor Rams offensive line and nearly destroyed Nick Foles in the process. He had no time to throw and it led to him continually making poor decisions with the football. Foles is not a quarterback that responds well under duress. Pro Football Focus ranks St. Louis as the 27th-worst offensive line in the league and they've continually allowed pressure on each passing play. The Vikings have done a relatively good job of making quarterbacks feel uncomfortable and that needs to continue again this week. He's obviously not a size mismatch for the Vikings' cornerbacks, but Tavon Austin has evolved in the Rams offense. He's corralled four touchdowns this year and nearly surpassed 100 total yards of receiving last year. The Rams coaching staff specifically likes to set up quick bubble and flanker screens to Austin. He has the playmaking skills to create big time action in space. It will be critical for the linebackers and cornerbacks to recognize when these plays are occurring. With Eric Kendricks out, Audie Cole will need to step up to diagnose plays in both the run and pass games. In addition, tackling well and bodying up Austin will prevent any major plays through the air for the St. Louis passing game. The Vikings got their passing game going two weeks ago against Detroit, but really had problems until the late stages of the Chicago game. Teddy Bridgewater was slightly off his game. However, he made the plays when it mattered most. Tomorrow, the Vikings need to get into a rhythm through short passing, supplanted by a nice dose of play action. Setting up the run game won't be easy against a St. Louis front that has allowed the seventh-fewest yards to opposing running backs this season. Nonetheless, by setting up the passing game, it will open up lanes and the box for Adrian Peterson to do more things. Also, the Rams make a plethora of substitutions to keep their defense fresh. By running some more no-huddle, St. Louis can be kept on the field in similar personnel groupings, which will significantly test their conditioning. Bridgewater always has a nice sense of the no-huddle. In fact, some of his best football has been played in this setting. This is the approach that would eliminate the Rams from keeping their defense fresh. The most important part of this game is winning the battle up front. Whichever team can do this will walk away victorious. Last week, Mike Zimmer was very pleased with the offensive line in pass protection. However, the Bears and Rams defensive fronts simply don't stack up. With Aaron Donald and Nick Fairley along with Robert Quinn, Chris Long, and Micheal Brockers, it's safe to say this will be the biggest challenge the Vikings offensive line has faced thus far. If the Rams dictate the line of scrimmage, it could be a long day for the Vikings offense. With such a talented group of defensive lineman, it won't take long for them to start creating turnovers, while keeping the Vikings from sustaining drives and moving the chains. This will be the most important aspect of the game that must be executed for the Vikings to walk away with a huge win.